Apollo on the left, Asclepius on the right, Chiron, the friendly centaur, in the middle - they're all are associated with medicine and prophecy. This painting goes much deeper into the mythology than the discussion below, although they're roughly contemporary. 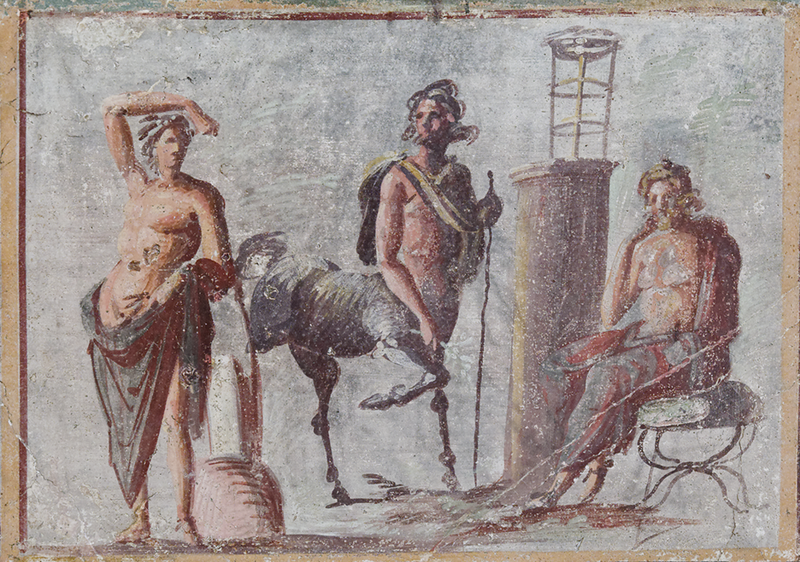 The fresco is in Naples at the National Archaeological Museum. Photo was taken by Marie-Lan Nguyen, via wikimedia commons. Apollonius of Tyana and his disciple, Damis, visit the Brahmin in India. Iarchas, the wisest of Brahmin, talks with them about the relationship between divination and medicine. Iarchas was first mentioned in 2.40 as the teacher of the Indian king, Phraotes, and it was the king who sent the pair off to visit him. I find the speech puzzling. "After [Damis' speech] all the wise men laughed, and when the laughter had calmed down, Iarchas returned to the discussion about divination. He said that among the many good things it had produced for people, the greatest was the gift of medicine. For the wise Asclepiads would never have arrived at knowledge of it if Asclepius had not been the son of Apollo. Having mixed drugs that were appropriate for different diseases in accordance with his (i.e., Apollo's) prophecies and oracles, he (i.e., Asclepius) passed on the knowledge to his own children and he taught his followers which herbs one should use for weeping wounds, which for parched and dry ones, and what are the right proportions for the drugs we drink, the ones by which dropsical diseases are drained and blood is restrained, and by which wasting diseases and the hollows thus formed are ended. And the cures for the bites of venomous animals, and the use of venom itself for many diseases - who would say these have nothing to do with the art of divination? For I do not believe people would ever have risked mixing the most deadly things of all into drugs meant to keep us alive without the wisdom of knowing what will happen before it happens." ἐπὶ τούτοις μὲν δὴ ἐγέλασαν οἱ σοφοὶ πάντες, καταστάντος δὲ τοῦ γέλωτος ἐπανῆγεν ὁ Ἰάρχας ἐς τὸν περὶ τῆς μαντικῆς λόγον, καὶ πολλὰ μὲν αὐτὴν ἀγαθὰ ἔλεγε τοὺς ἀνθρώπους εἰργάσθαι, μέγιστον δὲ τὸ τῆς ἰατρικῆς δῶρον· οὐ γὰρ ἄν ποτε τοὺς σοφοὺς Ἀσκληπιάδας ἐς ἐπιστήμην τούτου παρελθεῖν, εἰ μὴ παῖς Ἀπόλλωνος Ἀσκληπιὸς γενόμενος καὶ κατὰ τὰς ἐκείνου φήμας τε καὶ μαντείας ξυνθεὶς τὰ πρόσφορα ταῖς νόσοις φάρμακα παισί τε ἑαυτοῦ παρέδωκε καὶ τοὺς ξυνόντας ἐδιδάξατο, τίνας μὲν δεῖ προσάγειν πόας ὑγροῖς ἕλκεσι, τίνας δὲ αὐχμηροῖς καὶ ξηροῖς ξυμμετρίας τε ποτίμων φαρμάκων, ὑφ' ὧν ὕδεροι ἀποχετεύονται καὶ αἷμα ἴσχεται φθόαι τε παύονται καὶ τὰ οὕτω κοῖλα. καὶ τὰ τῶν ἰοβόλων δὲ ἄκη καὶ τὸ τοῖς ἰοβόλοις αὐτοῖς ἐς πολλὰ τῶν νοσημάτων χρῆσθαι τίς ἀφαιρήσεται τὴν μαντικήν; οὐ γάρ μοι δοκοῦσιν ἄνευ τῆς προγιγνωσκούσης σοφίας θαρσῆσαί ποτε ἄνθρωποι τὰ πάντων ὀλεθριώτατα φαρμάκων ἐγκαταμῖξαι τοῖς σώζουσιν.